Rouge left eye is missing a pink led at the bottom. Bleu's Ethernet connector is broken. Nao's overheats faster when using arms than using legs. Rouge left leg is overheating very fast when standing on that leg. Rouge is no longer able to standup from sitting position, due to problems with left ankle. Checked Bleu's Ethernet connector. Is now officially dead. Tried to make a wireless connection. Copied wpa_supplicant.conf_robolab to /etc. Bleu didn't started up anymore. Checked Rouge. No /etc/wpa_supplicant.conf on this stick. Made a web-connection with Rouge, but only the NIKHEF-W network was visible. Didn't know the password of the LinkSys router, adapter of the SiteCom router is broken (12V, 1A). Brought Bleu to Edwin for repair (after Christmas). Last June, Groningen bought five Nao robots: Mies, Bep, Henk, Jan and Kees. Contacted Tijn for their plans. Their forum name seems to be homerug. This is a link to their forum-messages. The forum name of Maastricht is UNM. This is a link to all their forum messages. The forum-name of Eindhoven is UNEIND. This is a link to all their forum messages. Contact is Tino Lourens. Aldebaran has published a paper about the interpretation of their emotional library (Aryel Beck, Antoine Hiolle, Alexandre Mazel, Lola Canamero, Interpretation of Emotional Body Language Displayed by Robots, ACM Multimedia 2010, Affine workshop, pp. 37-42). Was able to do the BehaviorControlDemo. Found the Gostai Forum a page how to access Global.BehaviorManager.getInstalledBehaviors();. Telecommande can be found on nb-unreal in mliem's svn: D:\svn\mliem\Aibo Telecommande - 1.5\windows. Using this command (after Global.ALProxy("BehaviorManager","bm");) gives ["standup", "sitdown"]. Changed the memory-stick of Bleu. Bleu boots again. Configured the wireless configuration @home. Downloaded several packages for python inside cygwin. Still, the gtk-module complains about gobject. Reinstalling the gobject-module didn't help. Installed OpenCV2.1, copied the Python-library into python's site-packages, made a cv.path which points to the correct directory, and the demo works. The sample-code works with the mini USB webcam, the skinfinder not?! Experimented with the right setup with my buildin webcam. Seem to work, but not that reliable yet. Back from holidays. Vanessa likes to give tomorrow a demonstration from the Rock, Paper, Scissors project, but according to RoboCup team both Nao's don't start up any longer. Lets try if I can fix Rouge. Activated the SMC 7804 WBRA wireless router from Theater Alaska. Router still has default password. Rouge didn't start up with the stick ALO 1.3.13. Replaced it with 1.3.17 and configured Rouge to connect to the SMC network. The demo should be launched with the Nao sitting on his hips (otherwise the Nao launches itself backwards). The skinfinder.py could access my webcam. Checked the sample in OpenCV2.0, and this piece of code was able to access my webcam. Unfortunatelly, copying the working line of code revealed that I have the wrong version of OpenCV (GetTickCount not known). Moved OpenCV2.0 to D:\tmp. According to WillowGarage, version 2.1 is the latest stable release. Only, sourceforge offers 2.0 as latest default version, although newer the newer versions are available under the file-section. Switched off the face-tracking in my camera. My Sweex mini USB webcam doesn't install automatically. Found official drivers with id JA000030. Changing from device 0 to 1 makes it possible to have the OpenCV 2.0 samplecode working for the Sweex webcam. Tomorrow I will install OpenCV2.1 and continue the test. Nimrod installed OpenCV, so the sensor part is working. The actuator part not, a Naoqi library was not found. Setting the PYTHONPATH to the Naoiq-sdk path solved the issue. For the Open Day, I downloaded OpenCV on nb-unreal. Tried to include module to python's library path, but on the end just copied the module into D:\Programs\Python264\Lib\site-packages. Next missing library was the machine learning library mlpy. missing numpy. Numpy site-down, Installed numpy-1.5 from disk. Got startMenu, training images failed because OpenCV didn't had method LoadImageM. Should download newer version of OpenCV. Under Linux, you can scan for wireless networks with the command iwlist wlan0 scan. Moved posts related to the introduction ceremony to seperate page. Brown's 'Builing Intelligent Robot' course gives insides about ROS. Read chapter 8 of Geometrical Algebra for Computer Science. Chapter ends with estimating a rotation from noisy measurements (called Procrustus or Wahba's problem). Should look towards the weighted scan matcher and generic IPC matcher. Read chapter 5 of Geometrical Algebra for Computer Science. Loved section 5.5 (Join and Meet mostly linear). No mathematician would dair to use something as such unprecise term, but here is shown how usefull the combined operations are. Have to ask about the operation ^-1* on page 130, which is not introduced. Read chapter 4 of Geometrical Algebra for Computer Science. Lesson learned, normal vectors do not transform as regular vectors, because they are the dual of a surface. Read chapter 3 of Geometrical Algebra for Computer Science and submitted my first errata. Found the old Tao project, which should give a C# interface to freeglut. Unfortunatelly, this old interface seems to interface to version 2.0 of Glut, instead of 2.4. Additionally, the vectors and discs are rendered by the default function draw(), which is part of the GA sandbox, but not of the C#-library of Gaigen2. This draw function selects the type of element to be drawn, and makes uses the selected function of the GLopen calls. Could be ported. More fundimental is the doubles and vector cannot be combined in the line ,tt>v2 = cos(a) * e1 + sin(a) * e2;, the overload of '*' doesn't work. Found some usefull suggestions in this Tao-usage example. This is my partly port. Which seems to be handy in the Gaigen2 distribution, is the GeneralMatrix.dll (including Inverse()!). Read chapter 2 of Geometrical Algebra for Computer Science. Should try exercise 2.13.1 with the new C# implementation of gaigen2. Downloaded Gaigen 2.5.2 from sourceforge. Also downloaded the source-code, because no Microsoft Studio solutions are provided by the generated algebras. First build cogsharp. Also downloaded sandbox from sourceforge. Was able to run the C++ example from this MS-solution, after downloading freeglut. Was able to include e2ga and e3ga C#-files from the Gaigen2 test directories. Made a port of exercise 2.13.1 code from C++ to C#. Only thing missing is a coupling to the glut library. Read the first chapter of Geometrical Algebra for Computer Science. Renamed the reference in nao_opening.py of nao_walking to get_nao_leg_moves. Demo works. Found out that the Rouge's microphones are behind the white tape, which could explain the noise in the recording sent to Aldebaran. Tried to flash an 1.3.8L stick from Choregraphe 1.6.13, but this only works for 1.3.17 and higher. Flashed the memory stick with script in NaoQiAcademicsvc80-1.3.8-win32\tools. Flashed the memory stick with script in NaoQiAcademicsvc80-1.3.8-win32\tools. Downloaded v1.41.12 of e2fsprogs to be able to update network settings on stick. That is for Linux and/or Cygwin. Downloaded v0.48 from ext2fsd and installed it on u153. Flashed again, because ext2fsd reports that the file system is RAW, and not EXT3. Removed the stick and reinserted. This time the file system was recognized. Nao didn't boot on this disk. Downloaded aldebaran-cpp-sdk-1.6.13-win32-vc90.zip. This package contains in its bin-directory the new flasher.exe application. With this freshly made stick the Nao boots, but doesn't connect to the network (also not wired). Did it again, this time with original gzipped image. Still, no connection. Strange enough, also do not see that the connection is active on the router (yes, I changed wires). With the 1.6.0, ifconfig also doesn't report a ip-number for the wired interface. Changed the two sticks, giving Blue the working stick of Rouge, and Rouge the freshly made stick. Now I could make a wired connection. Used the webinterface to activate wireless connection. Changed it back again, put a small wig below the ethernet connector and lay the cable over the head. Now I see three wired connections at the access point. No wireless connection, but I could activate that again via the webinterface. Also had to activate the wireless again for Rouge. Another difference is that Rouge has 5 behaviors, while Bleu reports n/a. Succesfully performed the demo, although neither robot recognized their command. Bleu-1, calling itself Blanche, didn't connect wirelessly. Couldn't find /etc/wpa_supplicant.conf. Configured the wireless via the new webinterface. Blue is running NaoQi version 1.6.13, including speech recognition software. Changed the volume from 71 to 87 (equal to Rouge). Rouge-2, still calling itself Nao, also didn't connect, although it new already the password. Rouge is running NaoQi version 1.6.0. Changed name to Rouge. Browsed the Advanced tab. All devices with version 30 and bootloader 7 showed error 168. Only LeftHandBoard shows error 113. No idea about the concequence. Bleu doesn't have voicerecognition. Inspected /opt/naoqi/lib. Rouge has an seperate directory for gostai here! More important, Rouge has /opt/naogi/lib/naoqi/libaudioin.so. /opt/naoqi/lib/autoload.ini (as used in the GermanTeam code) doesn't exist anymore. Downloaded naointro-code from google-code. Code loads naoqi.py from "C:\Program Files\Aldebaran\Choregraphe 1.6.13\lib". Gave for the moment the 1.3.8 equivalent D:\Programs\Aldebaran\Choregraphe\Naoqi\extern\python\aldebaran. Didn't work, so downloaded the requested Choregraphe 1.6.13 (including improved speech recognition). Downloaded PyAIML, because get_nao_speech.py has a dependence on this package. Also downloaded Python Imaging Library 1.1.7 and OpenCV 2.1, because every file had an unneccessary reference to these modules. OpenCV fials to load DLL (maybe need restart), so removed last unneccessary reference. First lines are the warning that Bleu doesn't have the SpeechRecognition module running. Received a movie from the opening scenario. Works fine, only have to remove the cables and make the walking secure. First experiments with bag and bottle. According to the Gostai documentation, you could directly use urbi-script if you add urbistarter to /opt/naoqi/preferences/autoload.ini. Found out that Brown university and Ludwig university had a ROS interface to the Nao. To be checked. Read the Technical Report about the FABRIK inverse kinematics solver. The algorithm translates the joints from end-effector to base and back. The longitudinal translation is to supported by the other joints, the lateral translation by rotating the joint. The later can be checked on constraints (see Fig 3.6). Read tutorial. They recommanded Bruyninckx's OROCOS for their independent Kinematics and Dynamics Library. Maybe nice to try this for the Nao problem. It would also nice to try Patrick's implementation for the UMI-RTX. Busy with paper for human factors event. Three pages is awefull short. Deleted sentence "Each factor is related with the level of responsiveness, judgment and activity of an actor, as perceived by an observer." Discussed the demo at the opening of institute. The idea is now to have a large red button on wheels, dragged by an Aibo and pushed by a Nao. The team stops before the second Nao, who stands up from a lying position and push the large red button. Installed Aldebaran SDK 1.6.0 for Visual Studio 2005 on pc-unreal (including C++ libraries). This installation package works! Unfortunatelly, the Choregraphe Activation Key not!! The forum indicates that the installation, and that yesterday a new version was made available. This one installs (although no link is made for other users than software). This version also doesn't accept the activation-key. Send an email to Tarik. Tried to install Python 2.6.4 and Choregraphe 1.6.13 on my desktop-pc u305. Unfortunatelly, Choregraphe has problems with its msi. Try 1.6.0 when site is online again. Tried to install NaoQi.Net SDK 1.6.13, which also failed. Tried again as admin with command runas /noprofile /user:machine\username "MSIEXEC /I D:\tmp\NaoQiDotNet-1.6.13-win32-vc90.msi", but that also failed with errorcode 2103. One hour for the game, both memorysticks got corrupted. Always shutdown on t he command-line before removing the stick. After a 10 minute time-out we were able to field one robot. Robot was not se eing the ball, but obstructed the other team effictive enough. (0-2). Flashed usb-stick with Robert's dual boot system. Removed on his system the link of wpa.conf to userdata, and replaced it with correct wpa.conf. Also update d correct interfaces. Executed copyfiles.sh script from nb-unreal. Unfortunatelly, three libraries are missing. Robrecht copied them from his ubunto distribution. Rsync complains that the wrong version of glibc.so.6 is loaded. 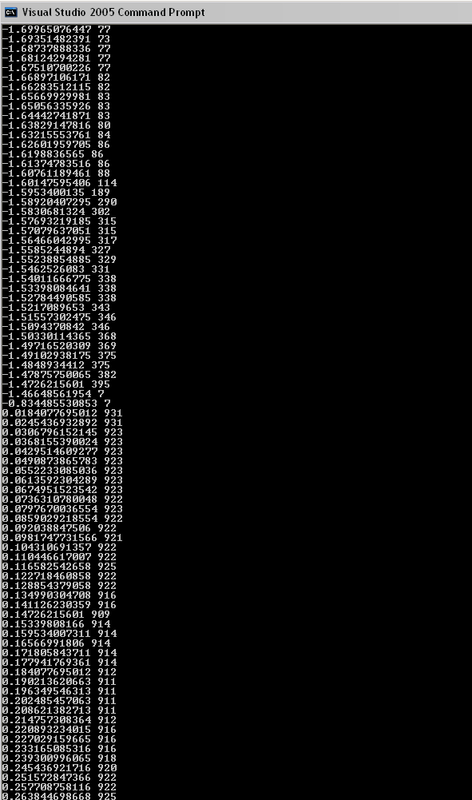 Copyfiles.sh checks if you are root. Created user root, and script continues. Checked in cygwin /proc/partitions for the name of the usb-device. It was the right size and the same as used under Linux, so I called flashAndInstall.sh -d /dev.sdc1 Bleu (after placing the naoqi-image in images). Script complaint that the device had just 1 partition (which was right, flashed it with naoqi-tools). Should try the script again with double partition disk. Arrived as one of the first teams at the Magdeburger Messe. Installed ourselves, arranged coffee and internet. Robots still not boot, waiting on Aldebaran. Copied ../Util/protobuf/linux/lib from u0152. Also copied libjpeg.a. Util only has URC project. Not clear (yet) how linux-libraries are build from source code. Our ball is officially approved by Thomas Roefer. ipconfig /release make sure that you don't get the same ip-adress again. Our linksys system is just a switch, so should have a dhcp-server. Found the German Open Schedule and Results page. Downloaded the 2009 Gamecontroller from the SPL site. Reduced penalty box: effects BH2009BehaviorControl\Symbols\field_symbols.xabsl, which is set in FieldDimensions::load. Changed yPosLeftPenaltyArea from +1500 to +1100. New ball placement after out of bounds: ThrowIn lines instead of points (changed point from ThrowInPoint from 1200 mm to EndOfLine -2000 mm (own) and HalfWayLine +0mm (opponent)). Smaller ball (radius 43mm to 33mm). Found no dependence on team uniforms (no opponent recognition yet). xPosOpponentGoal was already on 3500mm. Looked again at missing mkfs.vfat. Found some reference to source codes of mkdosfs, but no working download mirror. Found some reference that mkdosfs is part of the sRPMs package. This package is not available in cygwin, instead installed rpm and rpm-build (4.1.2). Still no mkfs.vfat. Discussed the issue with Ingo Sieverdingbeck, the creator of the script. They have never used the script from cygwin. Currently, they use ext2 as format for the second partition, so then it should be possible to use cygwin. Installed GameController (15-6.1) in DNT\Util. No difference between both versions of RoboCupControlData.h. Tried GameStateVisualizer, but only get use background image of Graz. Started SimRobot with Debug with Release libs. Viewed the colorspace. Had a crash in Matrix3d. Started SimRobot with Debug only. Started RoboCup view by double clicking on it. Simulation was awfull slow. Looked at DAT/RobotControl/bars/ColorTable64.cpp. Recompiled DT2006/RobotControl (finally, after 4 years). Bleu is under repair. USB-connection to head is replaced, ARM-processor (USB-protection failed), hip was broken. Rouge is back. USB-connection inside the head is replaced (to the head was all replaced). To check the wireless configuration, test with /sbin/ifconfig wlan0. Modified /etc/network/interfaces. Stopped driver with /sbin/ifconfig wlan0 down. Restarted with /usr/sbin/wpa_supplicant -Dwext -i wlan0 -c/etc/wpa_supplicant.conf. Complains about webkey. Downloaded crosscompiler from German Team on nb-unreal. Unzipped it with command bunzip2 (package was already downloaded from cygwin). Unpacked the archive in /, which created a directory opt/crosstool. The archive also places the two executables g++-linux-4.1 and gcc-linux-4.1 in /bin. The boost-directory is located at \opt\crosstool\gcc-4.1.1-glibc-2.3.6\i686-unknown-linux-gnu\i686-unknown-linux-gnu\include\boost. The python directory at \opt\crosstool\gcc-4.1.1-glibc-2.3.6\i686-unknown-linux-gnu\i686-unknown-linux-gnu\include\python2.5. The contents of NaoQiAcademics-1.3.13-Linux.tar.gz seems already included in the DNT-svn. sfdisk (tried libgsf (1.14.16), but isn't part)(tried nsf-server, isn't part)(tried gnome-vfs2, isn't part)(found it in util-linux (2.14.1)). mkfs.vfat (no), although mkfs.ext2 and mkfs.ext3 are present in /usr/sbin. Checked Google and wikipedia, but couldn't find the necessary packages for mkfs.vfat (seems to be mkdosfs package, but doesn't exist). Checked tt>flashAndInstall.sh. mkfs.vfat is called in only in wipeAndFlashDevice. Changed inside the script the parameter flashDevice="false"
Downloaded Graphviz(2.26.3). Installed it in D:\Programs. Opened BHuman.sln. Made _Solution start-up project. Called for a build of _Solution. Added D:\cygwin\bin to Tools->Options->VC++ Directories (after path). Behavior is now succesfull build, as _Simulator. crosstool\.....\ld: cannot find -lalcommon. Unpacked NaoQiAcademics-1.3.13-Linux.tar.gz in Util\alcommon\lib\linux (only windows was available). Now libhuman is build. Many libraries are available in extern\c\linux\lib, but no libjpg. The source-code is availabe in DNT\Util\libjpeg\lib. Downloaded Metamod-P to see if it contains libjpg. Answer is no. Downloaded libjpeg.so from tunis. This works, ld complains now about 'cannot find -l protobuf'. Protobuf is executable, not really a library. Should check DNT\Make\Nao.make.zbuild. Robert has made his laptop dual boot, and created a memory stick which seems to be fully equivalent. Unfortunatelly, both robots doesn't start up anymore, also not on the original working stick. Should check the presentations of the workshop at Mediterranean Open. Gave a successful demonstration of a soccer game with both Aibos and a Nao (Bleu). Bleu is looking for the ball, but cannot find it. The missing skrews of Rouge are ordered. The problem with ssh after phase2 was due to corrupted files on the stick (too early removal of stick?). After correcting this issue, the script copyfiles fails on the ssh-key (manualy the command still asks for a password). Send Bardia and Ravi a link to a paper about learning penalty kicks, including youtube video. Tried different usb-sticks. Red 1.3.13b is really broken. It cannot be read by Linux and Windows machines. Should buy a new one. Red 1.3.13a was partly booting. Have to check this stick. Purple 1.3.13 was booting, but was not had a name or a WLAN-config. Gave that stick to Bardia and Ravi to make a new bhuman stick. Put 1.3.17 in Bleu. The third time the robot succesfully booted. Unfortunatelly, downstairs so I didn't had an ethernet connection. Yesterday Robert and Maurits had problems with Bleu. The system booted, ifconfig indicated a wlan-connection, it was not possible to ping Bleu wirelessly. Bas found that the filesystem was giving error-messages. After finishing the field, the system didn't boot at all. Changing the memorystick didn't help, switching to third did. Yet, the booting takes a long time, and isn't always succesfully. Changed today the head of Bleu with Picket. No boot. Changed back Bleu's head. The eyes are now active, but no progress on the ears. Should check documentation. Bardia had problems with two projects on his Windows (Vista) platform. The Visual Studio projects called make -j 2 -f Nao.make, but make couldn't find /bin/sh. Checking his cygwin-path, I couldn't find the standard /bin:/usr/bin. His home didn't contain a .bashrc. Upgrading cygwin solved the issue. gcc is not in the list of required packages of BHuman, although some packages depend on it. Yet, Bardia had enough projects operational to start working. Bought today the carpet for the SPL soccer field (6 pieces, in total 8x5.5m). The manifacturer is skinflor (art.nr.063039834). Tested Rouge. Rouge has still it's robolab network configurtion. With normal head it could do FavoriteDance. Mounted the laserhead (with battery removed). Now the Nao boots, and could inspect the laservalues with Telepath (1.3.8).
. Named the head 'Piquant'. Tried to reset time. Tried to connect vislab. Got lease, but no connection to internet. Copied the configuration from Bleu, but to no avail. Changed configuration to robolab. Gave Piquant the fixed ip-adress 192.168.0.23. Looked how to access the laservalues. Checked ALMemory methods. Promissing methods getData, getDataOnChange and subscribeOnData. Started with modules\src\examples\helloworld. First added AL_DIR to environment. Script failed on python.exe (pthreadVCE2.dll not found). Installed D:\packages\phtread.2 from and added directory to the system-enviroment path. Only a limited of the 700 readings has length > 0. 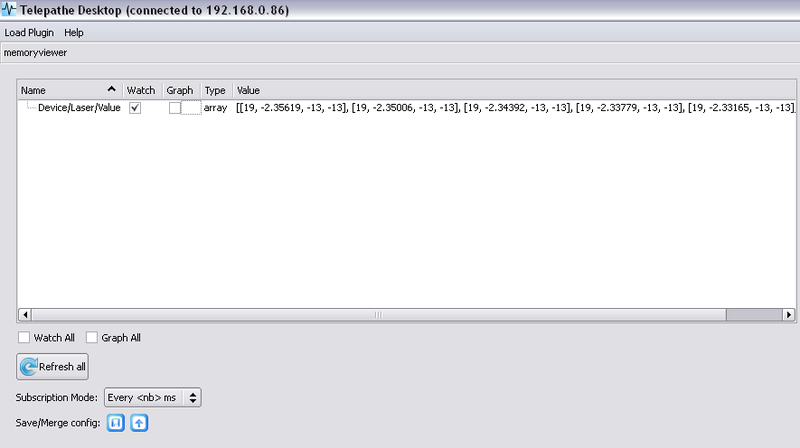 This readings indicate an object at 900 (mm) from 0.018 rad to 0.31 rad. This was a reading with a goal straight in front of the robot (distance ~1 m). When removed, only readings with angle < -0.92 give non-zero values (cabinet?). Put the Nao next to the wall. Saw the wall at 250mm to the right. Turned the Nao 180 degrees, wall is not longer seen !? Rouge is back from Aldebaran. Sent Tarik a mail for a short report of the repairs. Following actions were performed ' During the maintenance we changed the chest board and the connector between the head and neck. This preventive maintenance will allow to not have the same trouble on your robot. About the Laser Head, we change the connector head for preventive maintenance and we make all the tests with success.' Should check the operation this afternoon. Two new students (Ravi Gupta and Bardia Khalesi) who will work this month on the new street ball assignment.